Mastermind, the Perfesser, and Mr. Nice each try to steal a set of rare jewels. Coincidentally, Riddler is released from jail at the same time. His goons meet him at the prison gate, eager for the next job. But Riddler is convinced he’ll never outwit Batman, and is ready to throw in the towel. His boys persuade him to try once more. Later, Riddler uses a plane to sky-write his riddle. Meanwhile, Batman takes down Mastermind and Mr. Nice during their attempts to steal the jewels. When the Perfesser tries, Batman is occupied fighting his henchman, while the Riddler and his team make off with the jewels. The Perfesser informs Batman that Riddler has beaten them both. Batman chases after Riddler and catches the gang. Riddler is despondent, assuming Batman solved his riddle to thwart the crime. When Batman informs Riddler he hadn’t solved the riddle, Riddler is ecstatic, happily singing all the way back to prison. For some reason, Riddler stories in the animated comic book play out better than in the animated series. There are some real gems. This isn’t my favorite, but it’s still very good. 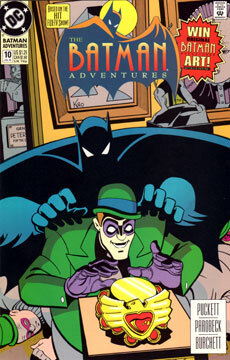 Unlike some of the animated episodes, this one deals with Riddler’s need to outwit Batman at all costs, else he is nothing. I’ve always thought a good Riddler story is hard to write, so I doff my hat to Mr. Puckett. This issue is also noteworthy as being our fist introduction to Mastermind, Mr. Nice, and the Perfesser. The trio shows up throughout the comic book run. I know there’s some creative backstory to them, but I can’t find what that story is. If anybody knows, please tell me! More greatness from Parobeck. I find it humorous, though, that Riddler’s gang is obviously a visual nod to the Three Stooges (including Schemp.) I guess nobody told Riddler his gang looked just like Joker’s. I think this would work well almost anytime after “If You’re So Smart, Why Aren’t You Rich?” Perhaps it would work best after “Riddler’s Reform” but before TNBA. Mastermind, Mr. Nice, and the Perfesser! Somebody needs to customize these guys.